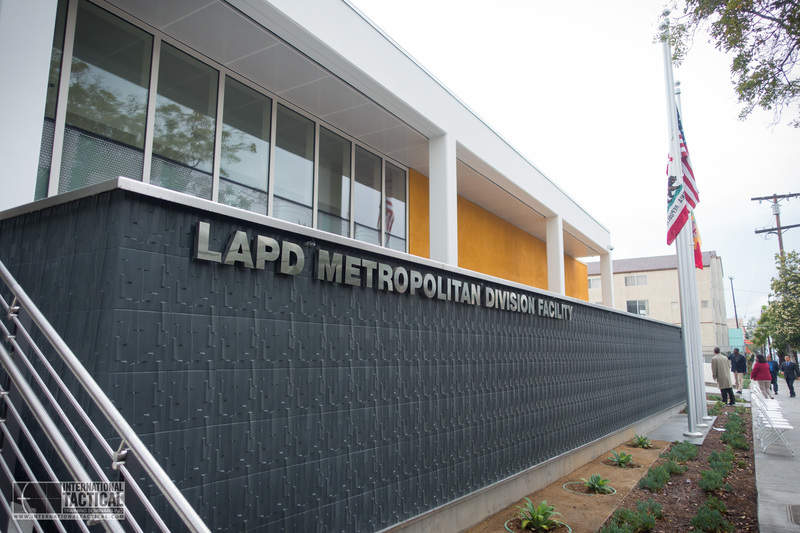 During my time in Metro, the Metropolitan Division was housed at 5th and Wall in downtown Los Angeles – second floor, Central Facilities. Metro dates back to 1933 and was originally housed in Parker Center in Room 114. It was a reserve unit hence the derivation of “R’ preceding a unit’s assignment. It was initially a mobile strike crime fighting unit which has expanded to present manpower of over 500 Officer’s (During my time, Metro held at about 240 Officer’s). 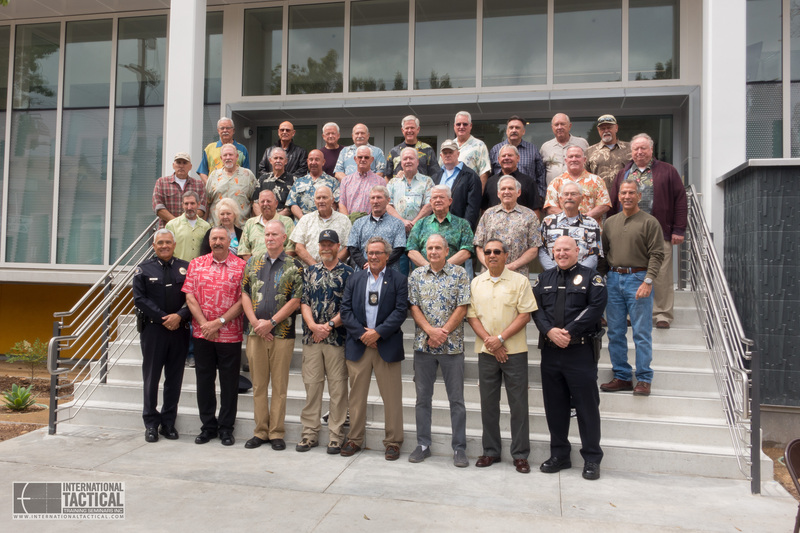 Remember when I told those of you about a Hawaiian shirt being a dead give-away for cop? Jordan never really believed me until the reunion. Check out all the old timers in, you guessed it… genuine, pineapple throwing, lava-lava wearing, coconut inspired, surf drenched, sand worn, sun bleached Haaywiaaan shirts! Now there’s some real history in that group for sure. Most of these guys were ‘dyed-in-the-wool’ honest to goodness, old time Metro coppers back in the day. The photo of myself with two individuals one in uniform and one in (you guessed it) a Hawaiian shirt are Ron McCarthy and Mike Hillman. 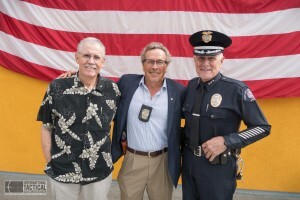 These are the two men who inspired me all those years ago to seek admittance into SWAT when we had one day at the Universal Studios back lot conducting SWAT Officer survival training. 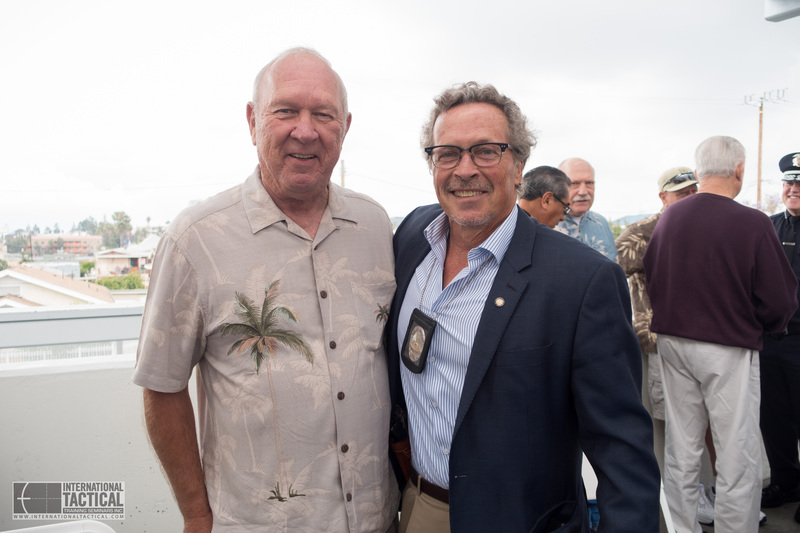 The other photo with a singular gentleman in a (you guessed it again) Hawaiian shirt is Ed Entwistle, my very first partner in Metro’s ‘B’ Platoon. Training back then was a far cry from all that is entailed in this day and age. As the expectation of an Officer’s performance in the field was significantly upgraded, so was the training when we conducted it many years later. 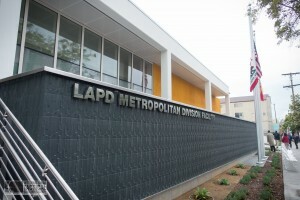 The picture of the door is the original Metro door reclaimed from the now defunct Parker Center prominently depicted in Dragnet, Adam 12 and countless other Hollywood renditions of the LAPD in action. 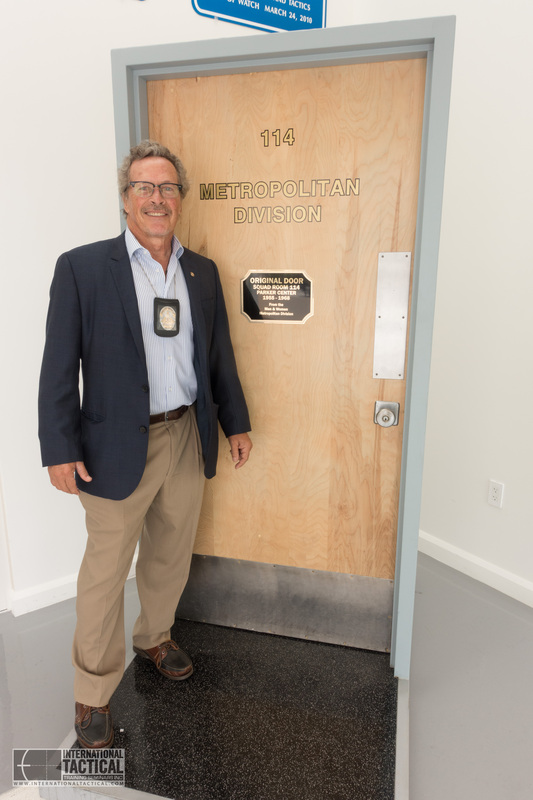 The door was reclaimed, refurbished and mounted and now stands prominently displayed at Metro’s new digs. 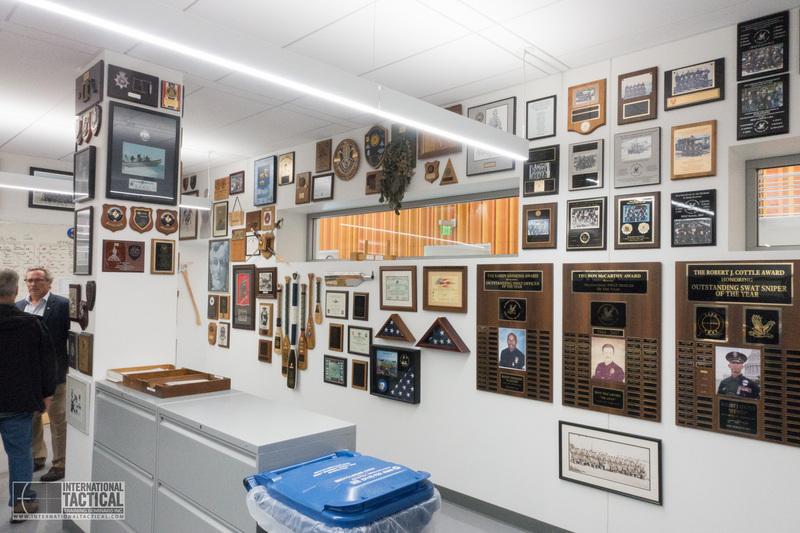 The photo of the wall covered in plaques is only one small portion of the awards, mementos and plaques of units who have trained from all over the world with Metro. The other wall surfaces are heavily covered as well. There’s a lot of history there and I’m quite sure that the tradition of Metro will keep on long after I and others are long gone. Time stands still for no man. As one grows longer in the tooth, one realizes the age old truth in this idiom. 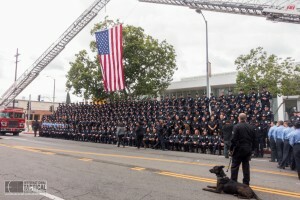 This entry was posted in Articles Written by Scott Reitz, Events, Favorites. Bookmark the permalink. Don’t know if you remember me as one of your students back here in Atlanta when you came back a few years ago for a pistol and shotgun class that I still remember very well. 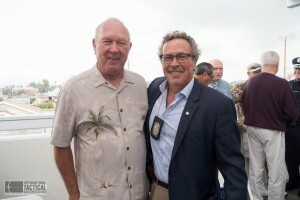 My question is on the picture of all the old cops. I don’t see any black cops or latino cops and you were in LA. What was that all about? Great question. 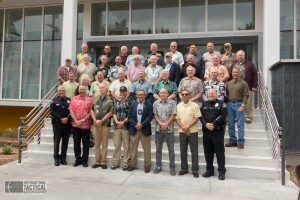 The picture is of those who chose to attend the Rampart opening. We had many Latino, Black, Asian and even Samoan officers in D Platoon. Think of it as the UN with guns! D platoon and Metro is very diverse and getting in is based on merit.